A dryer machine with two purposes can synchronously realize drying and vertical conveying function. Without mechanical force impact on the material during conveying, it's applied to requirements of nondestructive conveying occasion. With small land occupation, it's applied to arrangement of various working places. With low heating energy consumption, it adopts heat-conducting medium to transfer heat through jacket, its energy density is much higher than hot air, and it overcomes the shortcomings of low capacity usage ratio of hot air in traditional fluidized bed drying. With continuous movement of material in vibration, there is no material staying and heating time is stable and drying is uniform. It can heat by hot water, steam and conduction oil, with wide heating temperature range, and precise and adjustable working temperature control. Without external forced air entry, it avoids impurity contamination in hot air completely. With strong generality, it can be designed for up-charging material and down-discharging material or down-charging material and up-discharging material with height customized according to customer requirements. It can be designed disassemble insulation jacket structure to improve high thermal efficiency. 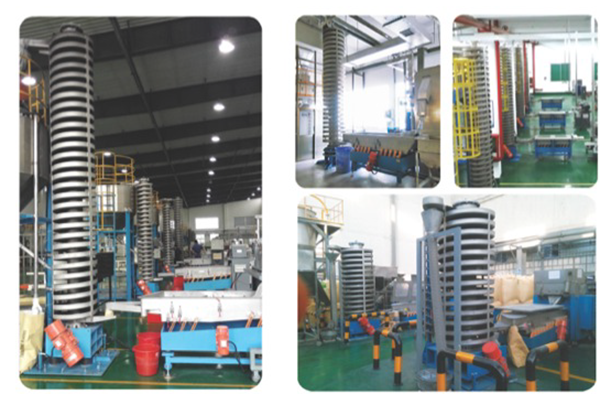 It can be designed enclosed air intake and exhaust structure to avoid environmental contamination of powdery materials. It can be added nitrogen protection atmosphere to prevent material oxidative deterioration during high-temperature operation. 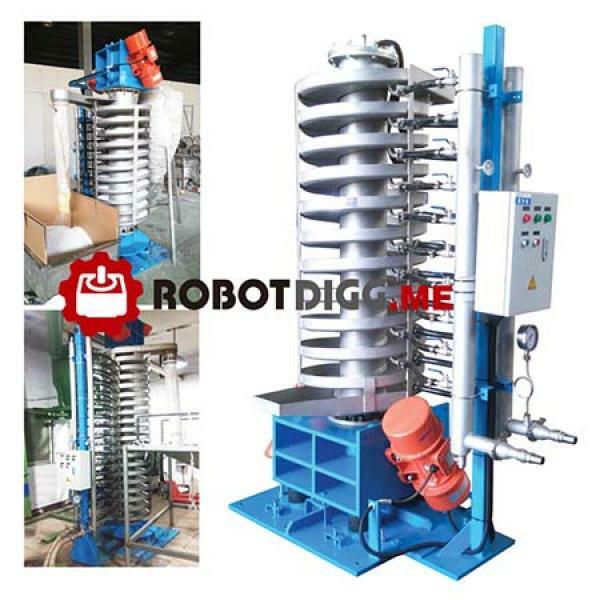 It can be adjusted conveying speed and conveying output by adjusting vibration frequency and exciting force to meet different dyr-time requirements of various materials. It can be added wear-resistant ceramic veneer layer to fi long-term conveying of high-hardness products. Without dead angle for overall equipment, it can be cleaned easily and adopt frequent switch between different materials. It adds jacket heating function on the basis of original vibration spiral elevator conveyor, and applicable to working environment required for continuous dry operation. The material is heated to dry temperature adequately by vibration disk with jacket during long-distance vibration conveying and vapor can diffuse through convection air. Its energy consumption is reduced obviously and comprehensive efficiency is improved obviously. Dry technological conditions can be adjusted flexibly, and it has automated control, improving product quality and stable quality. With continuous work and simple and convenient operation, working force is reduced and working environment is improved.